Ascending Butterfly: My First Wordless Wednesday! Butterflies I am sad to inform you all that technology has revolted against me today at 'Casa de Butterfly', my laptop is in the shop, and my internet connection has been spotty at best, so in honor of losing my battle to the 'tech war of winter 2010', I am hosting my first 'Wordless Wednesday'. They say you sometimes have to sit still and in silence to find inspiration. As I mentioned yesterday I usually keep my sanity in the winter by spending one week (or more) somewhere warm. 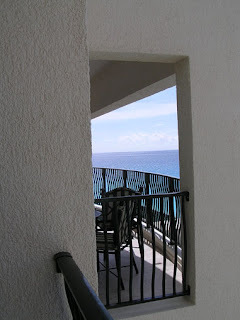 Here is a picture of the view from my balcony taken during my last trip to sunny Cancun, Mexico. I certainly wish I was there right now! If you don't see a post here tomorrow you will know I have lost the tech war altogether, or I have hopped on the next flight out of here in search of sunnier skies! wonderful post!~wish I was there too! Oh dear! Fingers crossed for technological luck. I am down my laptop, too, which has stuck me with the desktop that I share with EVERYONE so I feel your pain. I want to be there! Looks so warm and beautiful!